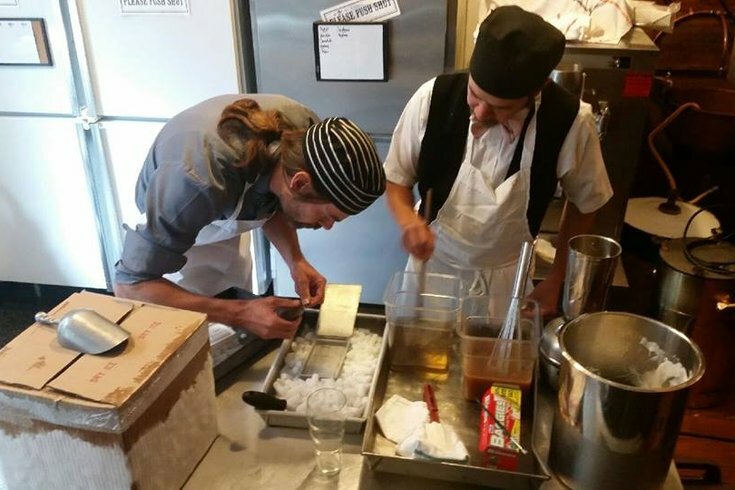 Ryan and Eric Berley cast the caramelized banana ice cream into their 1940 ice cream mold. During his visit to Philadelphia this weekend, the Holy Father will be indulging in a dessert made especially for him by a local shop in Old City. Following a dinner held at Saint Charles Borromeo Seminary, Pope Francis will be served ice cream made by Ryan and Eric Berley of Franklin Fountain. The ice cream will be Pope Francis’ favorite flavor – caramelized banana. It will be in the shape of the seminary. "We acquired in our collection years ago a mold from St. Charles that was designed for a 1940 archdiocese Jubilee,” Ryan Berley told CBSPhilly. "There were only 12 molds made. We had it because it was Philadelphia-centric and though it was interesting." You can get a scoop of caramelized banana ice cream at the Fountain and Divinity at Shane's.